Syrians Are Widely Critical Of Nobel Peace Prize Decision : Parallels Many say the award fails to recognize the victims in the country's war. Some even call it a present to President Bashar Assad for agreeing to give up chemical weapons. 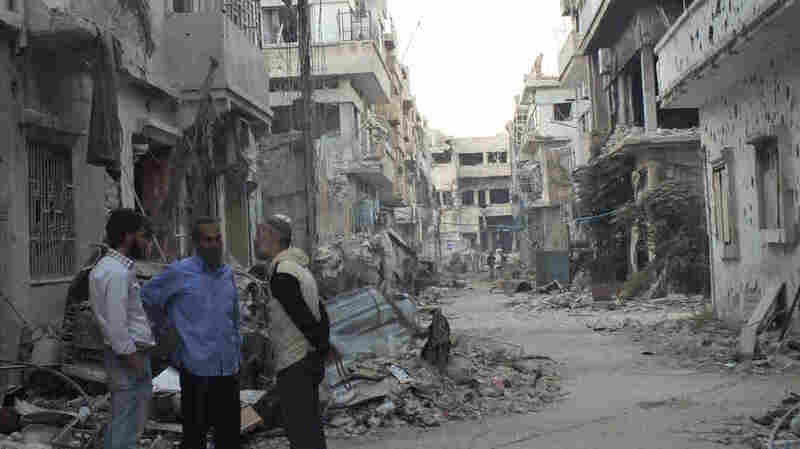 Men chat Thursday in front of badly damaged buildings in the central city of Homs. Many Syrians are critical of the Nobel Peace Prize that was announced Friday for the group that is in Syria to dismantle its chemical weapons program. Many Syrians are frustrated, disappointed and generally upset that the Nobel Peace Prize was awarded to the group that recently arrived in the country to dismantle the government's chemical weapons. 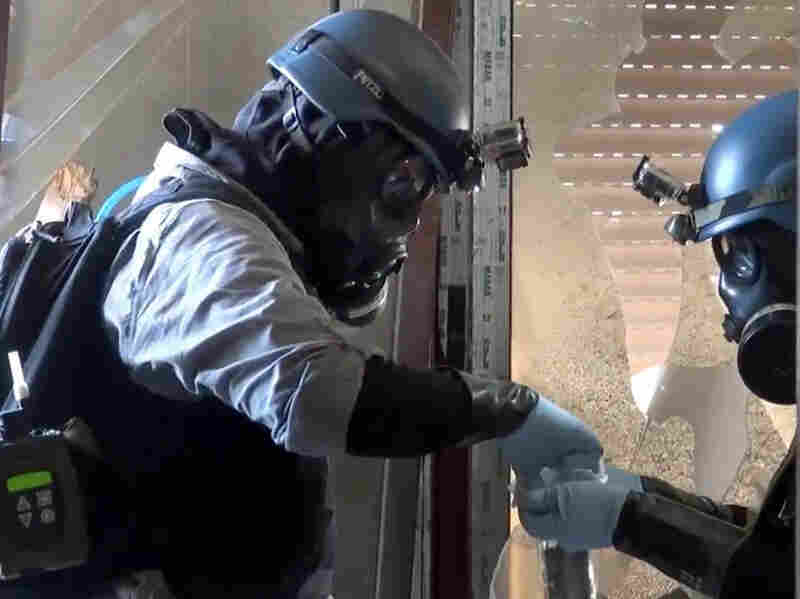 The Organization for the Prohibition of Chemical Weapons is a small, low-key outfit that has been placed in the international spotlight with its Syria mission and now a Nobel Prize. "An award for what? They have only been two weeks in Syria, and they already got the Nobel? It would have been more honest if (Russian President Vladimir) Putin got the award," says a sarcastic Kadar Sheikhmous, a Syrian activist who left the country and is now in Turkey. "The award should have gone to the children killed in the August attack on Ghouta," he says in reference to the chemical weapons attack in a suburb of Damascus that left some 1,400 people dead, many of them children. Members of a chemical weapons investigation team take samples outside Damascus on Aug. 29. The Norwegian Nobel Committee has a history of using the prize to highlight an international conflict and the work of those trying to resolve it. But the initial reaction among Syrians is overwhelmingly negative. Some Syrians cite the OPCW's short time in the country, though the Nobel committee noted the work the group has done elsewhere. Other Syrians feel that the award fails to recognize the more than 100,000 Syrians who have been killed in more than two years of warfare. Some even interpret it as a present to President Bashar Assad for agreeing to give up chemical weapons — even though the opposition says it was his regime that used them to deadly effect. Fayez Sayigh, a member of the Syrian ruling party, told The Associated Press that the award underscores the credibility of the Syrian government. Meanwhile, activist Yousef Al-Ahmed notes that the OPCW has not disarmed countries that are believed to have chemical weapons, such as North Korea and Israel. "The pursuit of peace does not only mean the destruction of weapons, but also dealing with a criminal. In my opinion, it's a lack of sensitivity towards people's feeling," he adds. Mohammad Attar, a Syrian playwright, speaking via phone from Beirut, says the world seems to have forgotten both the victims and the perpetrators. "The ethical question here is that people are focusing on the weapons instead of talking about the victims, and this is why Syrians feel as if the decision has been an insult and disappointment," he says. Mohammad Obeid, a Syrian now living in Doha, Qatar, says sarcastically that the Nobel committee "should have given it to Bashar [Assad] for his courage and his willingness to hand over the weapons after he used it to kill thousands, not to mention the conventional weapons that it is allowed to kill us with. We really have only God." Looking over dozens of posts on Facebook and Twitter, there was only one positive Syrian reaction, which came from a Syrian currently living in Istanbul: "They spread the peace around the world, especially in Syria, and they deserve the award."